The title of o’ death, the performance installation by findlay//sandsmark that played as part of PS122’s COIL Festival, comes from a recording by J.M. Gates entitled “Oh Death, Where Is Thy Sting?” Gates was a Baptist minister and prolific recording artist who, between 1926 and 1941, produced a series of records mixing fire-and-brimstone sermons with call-and-response hymns, the latter of which would be recognizable to anyone who’s seen O Brother Where Art Thou? and the former of which range from disturbing to hilarious (“Smoking Woman In the Street” is my personal favorite). If that’s pretty Beckettian sounding, indeed findlay//sandsmark are invoking the reference with a healthy dose of Beckettian irony. The company are inhabiting his familiar post-apocalyptic dreamscapes in o’ death, but with a twist pulled directly from Gates’s call-and-response song. As the audience enters the performance space (here in New York, IDEAL GLASS, a multidisciplinary gallery in the East Village), they carefully navigate themselves into cramped seating-in-the-round in relative darkness, as the elaborate set-installation groans to life. While the major pieces of the set consist of large Styrofoam sculptures by Jason Rogenes, they are connected by dismal bits of shrubbery—both growing from up from the floor like bushes and hanging down like anemic boughs from wires strung through the space. In fits and starts, these branches and leaves start to spasm, swishing about, operated by small motors so that the immersive world created onstage comes to life. This sort of wizardry isn’t surprising for the company, the joint product of lauded Norwegian choreographer and performer Marit Sandsmark and American performance-maker and designer Iver Findlay. But if at first blush it seems charming or whimsical, Pål Asle Pettersen’s ominous score quickly dispels any notion that this is a magical fantasia. Rather, from the moment Sandsmark begins her tortured, aggressive, and ultimately despairing movement score, o’ death begins to feel like a miserere, a plea to god for mercy in a merciless world. 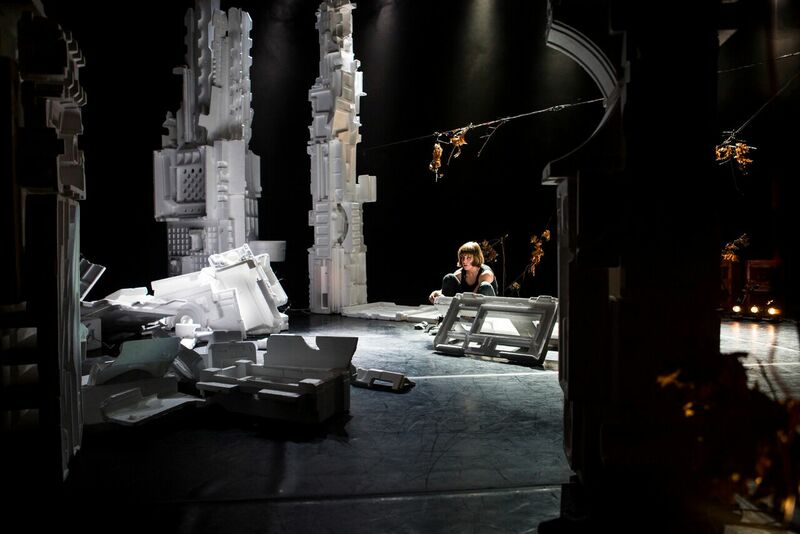 The atmosphere is post-apocalyptic (the piece even ends with a long and disturbing sound score and light show clearly recalling the percussive explosions of bombs all around us), and Sandsmark’s performance in relation to her responsive physical surroundings reads like a dark twist on Gates’s call-and-response style. Where Gates aims to raise up the souls around him by guiding multiple voices into a shared harmony, here harmony is impossible. Sandsmark’s presence onstage suggests she’s utterly alone. The only thing left to respond to her call is the dead and dying earth, subject—quite literally within the piece—to an ongoing destruction. Performed in low-lighting, it’s difficult to isolate much of Sandsmark’s movement score, but that’s surely the point. What can be said is that it uses pedestrian vocabulary in an aggressive fashion; it feels like Sandsmark is flailing at or fighting with imaginary pugilists, or perhaps moving for the sake of keep herself moving. Which ultimately she doesn’t. Briefly, having seemingly exhausted herself, she tries to take refuge in a hut constructed of Styrofoam slabs. But soon she winds up destroying it, smashing the slabs to pieces (the act of which, amplified by microphones onstage, produces a sound just shy of fingernails-on-chalkboard grating). It’s a potent metaphor. Having ruined the last bit of shelter available to her, Sandsmark is left exposed to the increasingly hostile elements, curling up pitiably on a white slab of Styrofoam. It’s tempting to read o’ death in wholly abstract terms, as with a Beckett play. Sandsmark’s performance is so solipsistic it feels like a metaphor for benighted human existence, desperately calling out to the void around us for succor, imagining a response from the non-human environment even as we hasten its (and our own) destruction. The use of Styrofoam alone, so weighted with environmental freight, makes some of these abstract ideas palpable, and suggests our own—as an audience—culpability in the destruction of our own environment. But that’s hardly the only way to read it, and perhaps represents my own biases more than anything. We don’t have to reach for biblical allegory for the story of a human displaced by violent destruction and desperate for shelter to make sense. I’m even sort of hesitant to read the Styrofoam as inherently bad from this angle. Seen from the perspective of the direct violence humans do to one another, its durability as a resource (and indeed, these sort of materials are frequently used to help provide for the displaced, from post-Katrina FEMA trailers to the needs of refugees entering Europe) almost reads like humanity’s last, desperate attempt to exceed its own destructive nature by producing a material designed to outlast our species. Styrofoam as the fragments shored up against our ruins. In any event, this polysemy is what makes the world findlay//sandsmark create so strong and impacting, and one of the few pieces from this January’s festival season likely to stick with me for long.